A few weeks ago, I updated my Freehand Raster Georeferencer plugin for the newly released QGIS 3. I also included a few fixes for some issues as well as new features such as uniform scaling, a new “Georeference with 2 Points” tool (contributed by a user) or taking into account an existing world file. Those changes were backported to the plugin version for QGIS 2 so there should not be any difference between the QGIS 2 and 3 versions. See the updated doc for information. The most obvious change was that the version of Python used for plugins is now Python 3. My code was pretty much compatible, except that I had to switch to relative imports and drop the u from strings. I used the standard 2to3 tool to check the code. The second most obvious change was the switch to PyQt 5 (instead of PyQt 4). Again, there were not a lot to changes: Basically, update the imported PyQt modules, as well as change the packages for widgets, now in PyQt5.QtWidgets instead of PyQt4.QtGui. I also had to rebuild the .py fils from the .ui with the pyuic5 tool. I also had to update the metadata with the new QGIS 3 version (qgisMinimumVersion=3.0). I was not sure when I published the plugin for QGIS 3 if the QGIS 2 version would be kept available for users still on QGIS 2, but there was no problem: The QGIS plugin manager shows the latest published version of the plugin compatible with either QGIS 2 or 3, depending on which one is used. The plugin is based around a QgsPluginLayer and I had to add 2 new classes that were not necessary in QGIS 2: one subclass of QgsDataProvider that needs to be returned by the dataProvider() method of my plugin layer + one subclass of QgsMapLayerRenderer that needs to be returned by the createMapRenderer() method. The QGIS project has released a tool and some instructions for migrating plugins. 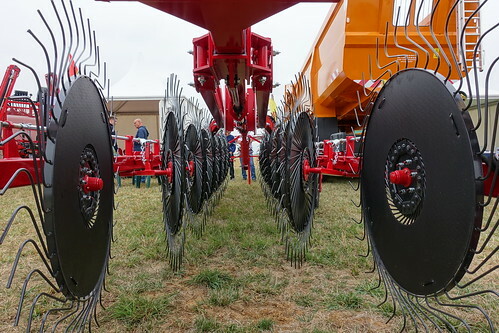 Innov-Agri is a large outdoor trade fair for agricultural machinery and equipment. In 2016, it took place in a field near Orléans. A lot of constructors were there and offered live demonstrations of their products. The company I work for was an exhibitor so I went there on the first day of the fair. I walked around and took a few pictures. Some time ago, I released a plugin for QGIS called “Freehand Raster Georeferencer” that allows interactive raster georeferencing. It implements some tools (move, rotate, scale, stretch…) to manipulate a raster directly on the map, on top of the other layers. This is in contrast with the standard raster georeferencing tool of QGIS, which needs control points and then an export to be able to check the georeferencing. Once the georeferencing is satisfactory, it is possible to export a new raster with a world file and then import it into QGIS in order to use all the available raster analysis tools. The main limitation of the plugin is the lack of support for all the GDAL raster formats: The plugin actually implements its own raster layer that uses Qt to perform reading and only some raster formats are supported (BMP, JPEG, PNG, TIFF). The code is opensource and on Github. Here is some documentation on the tools. Some time ago, I saw this article about using the Qgis2threejs plugin to export a QGIS map as a 3D visualisation in the browser, thanks to three.js and WebGL. When I recently tried to follow the post to reproduce the results, I had some problem sourcing the data (related to Vienna, Austria) so instead I searched for data related to Paris to create a similar scene. Here is the result corresponding to the screenshot above and another one with aerial photos, both showing the Montmartre area of Paris. Base map: OSM Mapnik tiles. 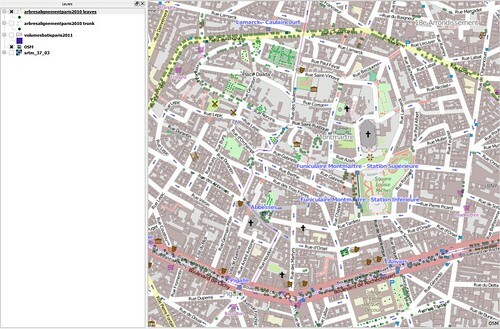 To display them in QGIS, there are multiple ways: Either use the OpenLayers plugin, by selecting the OpenStreetMap layer, or the TileLayer plugin, by first copying this tile description file into the ~/.qgis2/python/plugins/TileLayerPlugin/layers/ directory and then selecting the OSM layer with the plugin. Elevation data (DEM): I downloaded the tile that covers most of France from the SRTM Tile Grabber. 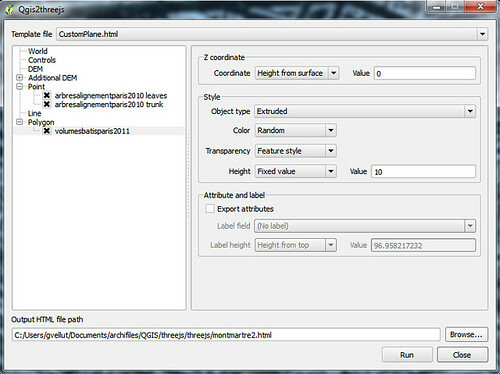 It provides a Tiff that will be displayed by QGIS in levels of gray by default. Tree data: a SHP layer with the locations of trees lining the streets of Paris (Arbres d’Alignement), obtained from the French OpenData portal (data.gouv.fr). I actually added the same layer twice in the QGIS project, so that in Qgis2threejs, I could export one of the layers as the trunks of the trees (cylinders) and one as the leaves (spheres). I kept one of the layers visible, rendered as a circle with some transparency so it would look like a shadow of the tree, and hid the other. 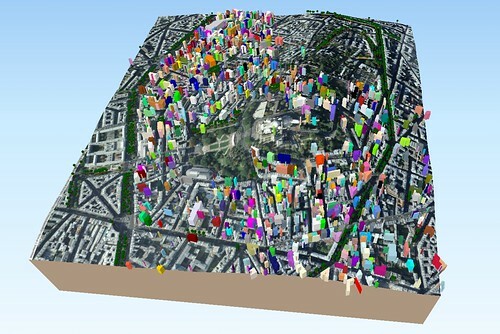 Building data: a SHP layer with the location of buildings in Paris (Volumes bâtis), obtained from the Paris OpenData portal. 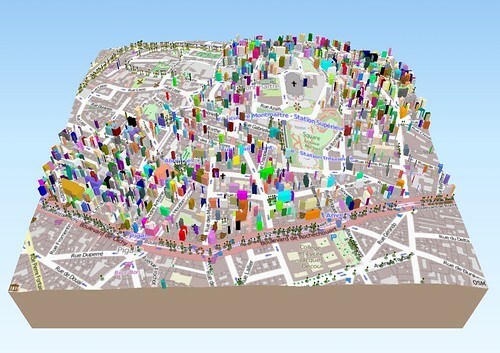 It only contains the first 50000 buildings of the full dataset. The full data is pretty big, so this will do for my needs. If necessary, the GeoJSON dataset contains all the buildings. The Qgis2threejs plugin will use what is currently in the QGIS map window as the texture for the 3D terrain. Therefore only the layers that should be in the output should be kept visible: This is why some of the layers are unchecked in the QGIS UI shown in the screenshot above. DEM: The SRTM elevation data. Tree leaves: Green sphere of radius 3m at 5m above the ground. Tree trunks: Beige cylinder of radius 0.5m and height 5m at 0m above the ground. Buildings: Extrusion of 10m, with random colors. I also applied some vertical exaggeration in the World settings. After launching the conversion (which does not take very long for such a small extent), the browser opens a web page with the exported visualisation. Above, an alternative version, with aerial photos. I released a free app called Tokyo Ramen Map a few weeks ago on the Play Store. It is a simple map application showing all the ramen restaurants in central Tokyo, along with ratings. I built it for my needs so it is quite bare bones. The main point was to make it work offline since I don’t have a data connection outside my apartment. It uses cartographic data from the OpenStreetMap project, rendered on the device through the Mapsforge library. The positions and ratings of the ramen restaurants come from scraping the RamenDB website. All the code for the app is open source and available on github. 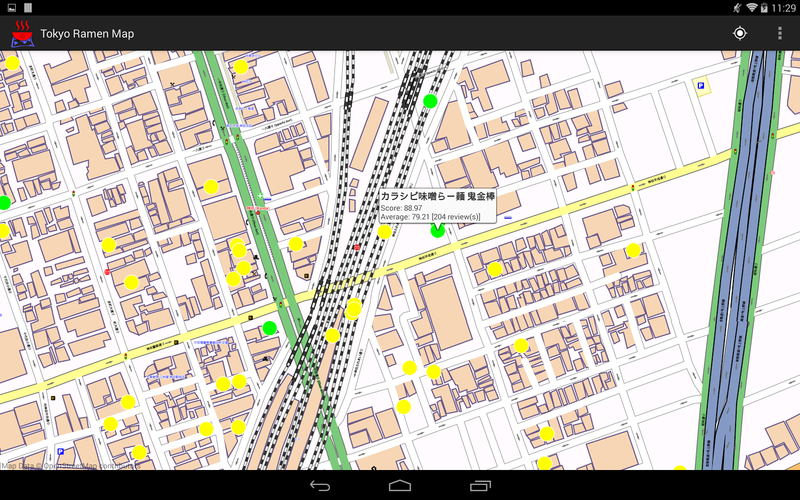 It can also be used to generate OpenStreetMap-based apps for any city, with the option of pre-loading points (like the Ramen app) or letting the user add their own. As an example of the latter, I have released apps for Tokyo (Tokyo Offline Map), without the ramen shop layer, and Geneva (Geneva Offline Map). Android has added support for Bluetooth Low Energy (aka Bluetooth Smart) and thus iBeacon (a profile of BLE) in version 4.3. However, on my Google Nexus 10 (2012 edition, now running Android 4.4 aka KitKat), support is disabled in the official version provided by Google, even though the hardware supports it. Since I want to try out (and maybe develop) apps that use iBeacons, that makes me a very sad panda… Thankfully, there is a way to enable it, by replacing the original Bluetooth-related libraries on the device with patched libraries that add support for Bluetooth Low Energy. I have created an update ZIP file for the Nexus 10 (aka Manta) and Android 4.4 build KRT16S: The file can be downloaded from here. It was generated by getting the source of Android (branch android-4.4_r1.2), applying this patch by Manuel Naranjo to reenable Bluetooth Low Energy, recompiling (with target aosp_manta-eng), replacing the content of the update ZIP created by XDA Developers user Keine with the newly compiled libraries and, finally, signing the new ZIP. !!! Although this seems to work fine for me, I am very new to this so use the ZIP and the instructions below at your own risk !!! The patch can be tested with an Android app like iBeacon Locate (by the makers of this opensource iBeacon library for Android). 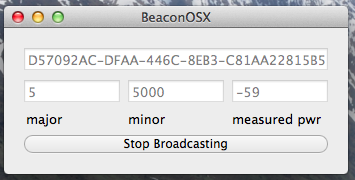 I also needed an iBeacon transmitter: I used this opensource Mac OS X application that can run on my Macbook Air running Mavericks (but an iPhone or dedicated hardware could work too). 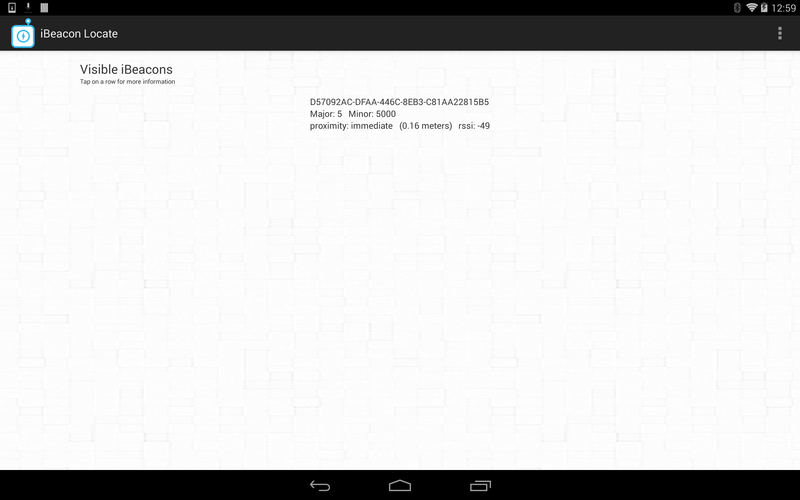 I was surprised to learn that the Nexus 10 cannot be updated in the usual way (OTA) after this kind of operation. It is possible to rollback to the original libraries of build KRT16S using this ZIP (the files were obtained through “adb pull /system/lib ~/backup” before applying the BLE update ZIP). Then the new Android build can be installed (for example using sideloading) and the BLE update ZIP reapplied on top (I have tested this with 4.4.2 aka build KOT49H). After an OTA update and before applying the update ZIP, the libraries will have to be backed up to create a new rollback ZIP for that version. Or maybe more simply, the device can be reset to its factory version.